The Maywand District of Kandahar is called by both local Afghans and Canadian Soldiers of Task Force Kandahar as the Wild West. Up to mid Summer 2008 there had been no sustained Coalition Force presence to interdict the Taliban and protect the western approaches to the strategic Southern city of Kandahar. In July 2008, Task Force Ramrod (2nd Battalion, 2nd Infantry Regiment) of the 3rd "Duke" Brigade of the 1st Infantry Division (Big Red One) deployed to Southern Afghanistan to conduct Counter Insurgency (COIN) operations in the volatile and strategically important Kandahar Province. Task Force Ramrod, detached from its parent brigade, operated NATO OPCON to Task Force Kandahar, a Canadian Brigade responsible for the security and stability of the entire Kandahar Province. The Task Force included over 1,000 combined US and Canadian Soldiers, Airmen, and Marines. Roughly the size of Rhode Island, the Maywand District had been the Taliban's place of refuge and succor, a haven where they stored supplies and planned operations. That ended with the arrival of the Ramrods on 15 August 2008. Mine Resistant Ambush Protected (MRAP) Vehicles, the Route Clearance Package and their special skills and the OH-58 Kiowa Helicopters from Task Forces Eagle Assault and Wings (101st Combat Aviation Brigade) supported the task force allowing the Ramrods to dominate the area and freely move about the battlefield in one of the highest IED threat areas of the country. Twelve months of counter insurgency operations, conducted while simultaneously building support and infrastructure set the stage for the successful deployment of follow on forces in the summer of 2009. 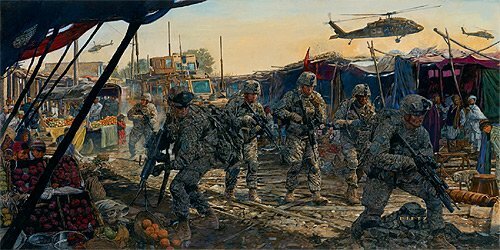 This print commemorates the fortitude, endurance, and courage of those Soldiers of the Task Force who risked their lives conducting combat operations throughout the Kandahar Province. They brought peace, development, and hope to a tired people and ensured the Taliban's days were numbered, while paving the way for follow on US forces.